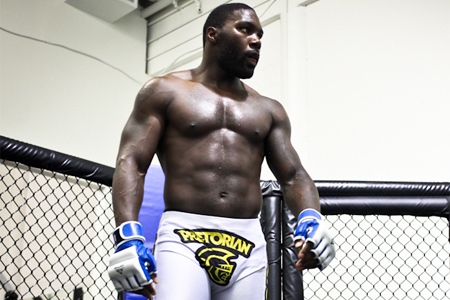 Former UFC star Anthony Johnson (Pictured) will make his post-UFC debut against David Branch at “Titan Fighting 22.” The middleweights will headline the May 25th event inside Memorial Hall in Kansas City, Missouri. HDNet broadcasts the main card live at 10PM ET/7PM PT. “I have a lot of respect for David Branch for taking this fight, but it doesn’t really matter who’s in the cage with me, because the fight’s going to end the same way – with him on the floor and me standing up,” said Johnson. “Rumble” looks to start anew after a controversial run with the world’s premier mixed martial arts promotion. UFC president Dana White lambasted Johnson in January for missing weight in his UFC 142 shootout against Vitor Belfort. For a non-title middleweight affair, fighters are allowed to weigh a maximum of 186 pounds, which is exactly what Belfort checked in at. Johnson weighed in at an astonishing 197 pounds. White immediately fired the 28-year-old after getting submitted by Belfort. Johnson owns a 10-4 professional record and posted a 7-4 mark for the world’s premier mixed martial arts promotion. Branch is a Renzo Gracie jiu jitsu black belt and owns a 8-2 résumé. The 30-year-old won half of his four fights inside the Octagon.